Break all the rules and explore acrylic paint in a free and fun way! This book encourages you to get over the fear of the blank canvas and the anxiety over the outcome, and focus on the process of painting and the joy of creating. Whether you’re a nervous novice who doesn’t know how to get started or a skilled classical painter looking to try something new, you will benefit from the activities in this book ranging from quick, messy and expressive exercises to relaxing and meditative paintings. 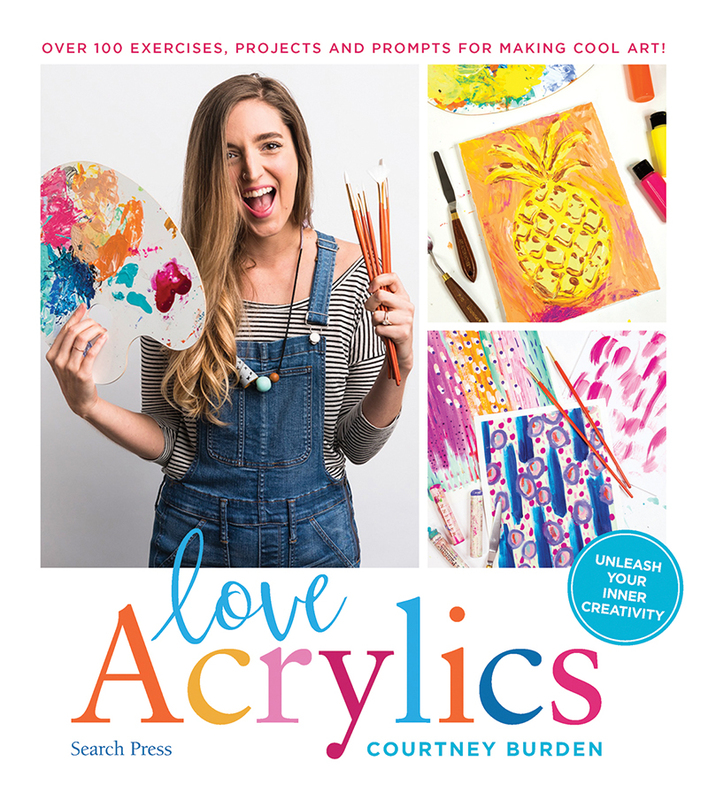 Artist and teacher Courtney Burden shares 100 prompts and projects that will build your confidence and inspire you to roll up your sleeves and play with acrylic paint in a pressure-free way. There is no right or wrong way to create a painting, so enjoy the journey, relax, unwind and have fun! Courtney uses different tools to bring her subject alive: play is for technique-learning, where Courtney shows her methods and processes; prompts are for experimenting; projects are structured with specific outcomes in mind. You’re really inspired to paint, but don’t know how to get started. Maybe you’re trying out a new hobby or maybe you’re just new to the medium. In this chapter, Court promises to educate you on the acrylic painting process and the supplies you'll need to help you over the hurdle of the blank canvas. This chapter covers basic tips, tricks, and techniques often used by acrylic artists such as ways to keep your paints wet, blending, mark making, and mini activities to build your confidence in painting. Throughout, the focus is on the idea of play (process) over product, or end result. Have fun getting to know your paints and brushes, as well as feeling comfortable and confident with the medium to begin creating. This chapter is designed to help you get into the habit of painting daily and freely, if only for 15 minutes at a time. It encourages you to use different quick techniques and prompts to engage in painting in a pressure-free manner, always focusing on the process rather than the result. Take your paints outside and engage in the medium in new playful ways. Prompts in this chapter encourage the beginner artist to engage their creativity by using both sides of their brain and body with activities like painting with both hands simultaneously. To engage with the acrylic painting process in a quick and friendly way, on a daily basis. Ranging from simple exercises to quick projects to be completed in 15 minutes or less. The reader is encouraged to let go of the outcome and enjoy the creative journey of painting. Exploring quick techniques to take their acrylic paintings to a new level. This chapter explores colour and the effect it has on you. Courtney will inspire the reader to use color in new and exciting ways, challenging readers to use color combinations that he or she may not naturally gravitate toward, as well as demonstrating how you can use color to add depth to your paintings. To explore the depths and meaning that color can have on a composition, and how to combine color in new and interesting ways to create a painting that pops! This chapter demonstrates different ways to add dimension to your painting by creating texture with various techniques. Some artists use texture as a major influence in their work as a way to draw the viewer to look closer. Play with different types of molding paste, varnishes, and experiment with painting without a brush to create different types of texture. To educate the reader on various methods for creating texture and depth in their painting. Whether you're on a tight budget and can't swing the cost of canvas, or you're just feeling creative and want to try something new, this chapter will show you how you can paint on nearly anything that will sit still long enough. Thinking outside the box and painting on non-traditional surfaces.